A member of an FBI evidence recovery team photographed the building following the shooting of Ibragim Todashev. ORLANDO — An FBI agent from the bureau’s Boston office fired the shot, or shots, that killed a friend of Boston Marathon bombing suspect Tamerlan Tsarnaev early Wednesday morning during an interview about an unsolved Waltham homicide, say officials briefed on the investigation. Ibragim Todashev, a 27-year-old mixed martial arts fighter formerly from Allston and Cambridge, was shot in the kitchen of his apartment after overturning a table and attacking the agent with a blade, the officials said. The Globe has reported that the shooting came after Todashev had implicated himself in a grisly 2011 triple homicide in Waltham. Tamerlan Tsarnaev was friendly with one of the Waltham victims, and authorities suspect he may also have taken part in the slayings. “This was a tough guy; he was a dangerous individual,” one law enforcement official said, speaking of Todashev. The official asked not to be named because the official was not authorized to discuss the case. An FBI team from Washington, D.C., is investigating what happened in the apartment. FBI spokesmen in Boston, Florida, and Washington had no comment Friday. Some of Todashev’s neighbors recalled hearing a series of loud bangs during the early morning hours Wednesday. But loud sounds after dark are commonplace at the condos, which sit in the shadow of Universal Studios, which holds frequent nighttime concerts and events. “I figured it was just fireworks at Universal,” said Gary Campgana, who lives a few apartments away from Todashev, pointing to the amusement park. The regional medical examiner’s office confirmed that it is in possession of Todashev’s body but would not say how many times he was shot. Todashev’s friend Khusen Taramov, who accompanied Todashev’s estranged wife to identify the body, said he was shown only part of his dead friend’s face and did not see any wound. But doctors told him his friend was shot multiple times, he said. Tamerlan Tsarnaev was killed after a shootout with police in Watertown April 19. His brother and alleged coconspirator in the Marathon attack, Dzhokhar Tsarnaev, is in federal custody facing a possible death sentence in the bombing that killed three people and wounded more than 260. The brothers are also suspects in the April 18 slaying of MIT police Officer Sean Collier. 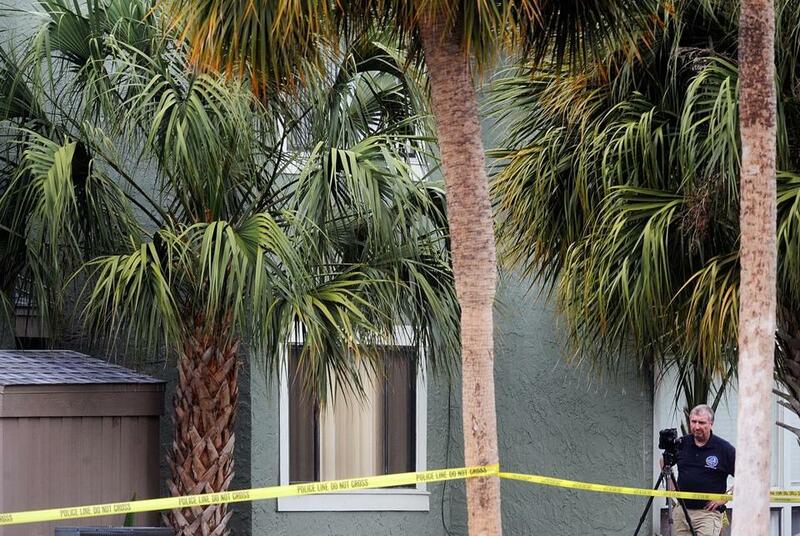 In Orlando, local police and FBI agents continued to keep watch over the scene of the shooting Friday, as investigators in white jumpsuits and yellow boots continued to move in and out of the apartment’s rear entrance. Most of the reporters who had been camped at the scene since early Wednesday were gone, and life in the complex had mostly returned to normal. Todashev’s wife, Reni Manukyan, who traveled to Orlando from her home in Georgia to help arrange her husband’s burial, plans to accompany the body back to Russia. He also cast doubt on reports that his friend had violently attacked the agent, saying that Todashev was recovering from a knee injury and that agents had kept tight control over him at prior interviews. Taramov, who is helping coordinate the burial in Russia, said the FBI has yet to return Todashev’s identification papers, which has impeded the process of returning his body to his family. The bureau has said it will return Todashev’s travel papers and could hand them over as soon as Monday, said Taramov. However, he added, they told him it could take as long as three weeks. “I’m hoping for three days, not three weeks,” he said.